A University of Manchester historian has discovered how the Methodist Church built some of Britain’s most important and successful community buildings in the early 20th century – but are now mostly forgotten. Dr Angela Connelly says that 99 ‘Methodist Central Halls’ were built, costing an equivalent of £90 million in today’s terms. Today, the Methodist Church owns only 18 of the original buildings, many of which have been substantially altered. Twenty seven have been completely demolished or bombed in the war. Nineteen are protected as listed buildings and all, she says, were large buildings designed not to look like a church. Dr Connelly, who is based at the University's Manchester Architecture Research Centre, said: “Nearly everyone in the UK will have seen a Methodist Central Hall: Pavarotti performed at Kingsway Hall and the UN Declaration was signed in Westminster Central Hall. But few of us know what they are, how they are used or what has happened to them. “Because they do not look like churches or cathedrals, the public aren’t aware of those that remain at all – especially those which have been converted into other uses such as bars and pubs. The decline, she will say in a Bulletin of the John Rylands University Library of Manchester paper this month, is down to a long period of drops in Methodist congregations nationally, as well as even steeper losses through inner-city demographic and economic changes. Her Arts and Humanities Research Council funded study shows how the Missions promoted cultural activity to make religion relevant to everyday lives and tempt people away from the lure of alcohol. These included popular entertainment such as film shows, concerts and variety performances. 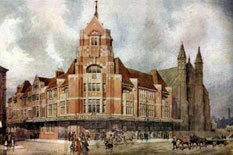 Joseph Rank – of Rank Hovis – provided much of the capital to build the Central Halls. His son, J Arthur Rank, the film producer, was also a prominent Methodist who became interested in the movie industry after seeing the pioneering use of religious films at the Methodist Missions in the 1920s. The wife of the Methodist Times founder and reformer Hugh Price Hughes, also established the nation’s first ever crèche for working girls at the West London mission in the 1880s. Dr Connelly added: “As numbers dropped and maintenance costs spiralled, rooms were let out to other organisations and the Halls were used for a wide variety of events. “Through the 20thcentury, more space was rented out to other organisations for theatres, libraries, social services and even school exams. “Grimsby and Southampton are now theatres, Liverpool’s Central Hall on Renshaw Street now hosts a collection of independent traders. At Bristol and Bradford, the Central Halls are converted into flats. “These halls were, and in several cases still are, the best venue in town.